Ready to handle whatever you throw at it, this combo file has everything you need to keep your office organized. 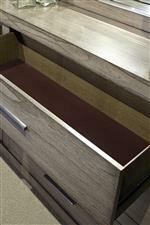 The bottom drawer is suitable for legal or letter size files, and both drawers are lined with black PVC to ensure ultimate durability. As an added bonus, the top drawer comes with a pencil tray and removable dividers, serving as a great spot to keep extra office supplies. The Modern Loft Contemporary Combo File with Locking File and Two Shelves by Aspenhome at Walker's Furniture in the Spokane, Kennewick, Tri-Cities, Wenatchee, Coeur D’Alene, Yakima, Walla Walla, Umatilla, Moses Lake area. Product availability may vary. Contact us for the most current availability on this product. Storage 2 drawers, one is locking and works for legal and letter size files. The other has a pencil tray and a drawer divider. Two shelves on the top left side.